One of the first things I noticed was that the holding tank float was set too low in the tank. This is usually an easy problem to fix, just take the top off the holding tank and pull the float up a little. You may have to adjust the weight or support of the float, but that's easy. It does take a little time though to get it right and you may be walking back and forth from the well over several days getting to the satisfactory setting. 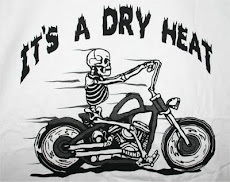 OR, wasting a bunch of water dumping and refilling the tank. Not a very good solution. I opened the tank up and took a close look at the float. First thing I noticed was that the wire on the float was taped. What? Why would anyone tape a wire that was suspended in water and carried 220 VAC through it? I was really careful with it and followed the wire to a piece of conduit that came through the side of the tank. 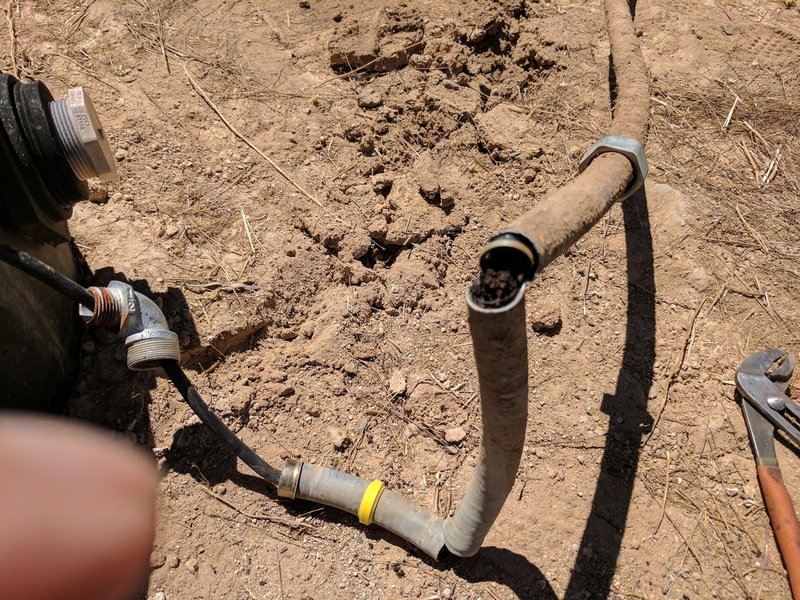 Think about this a minute, there was no box to connect the float, the wire from it ran directly into conduit. Following the conduit it led to a box on the wall surrounding the well. I opened the box and didn't see the wire from the float, instead there was a piece of 18 gauge stranded double cord in there. That's exactly the same wire that your bedside lamp would use. Hardly the right wire for a float switch that carries 10 amps of 220 VAC around a well. This is the (supposedly flexible) conduit. Notice that it snapped in half in two places. Didn't take much force, I'm a little skinny guy. This is looking down into one of the breaks. What I intended to do was pull the wire out and see what was going on; I couldn't. The wire had burned and the inside of the conduit was destroyed. This is the other end of the wire. Notice the tiny lamp cord that is coming out the other end of the conduit? Sorry, the conduit was already buried when I took this picture. Let's look a little more closely at the float now. The gray cylinder at the end of the wire is the actual float switch, the other cylinder at the right is the weight that holds it down in the water. Notice the shiny part of the wire near the center of the picture? That's electrical tape that hooks a replacement float to the old wire. 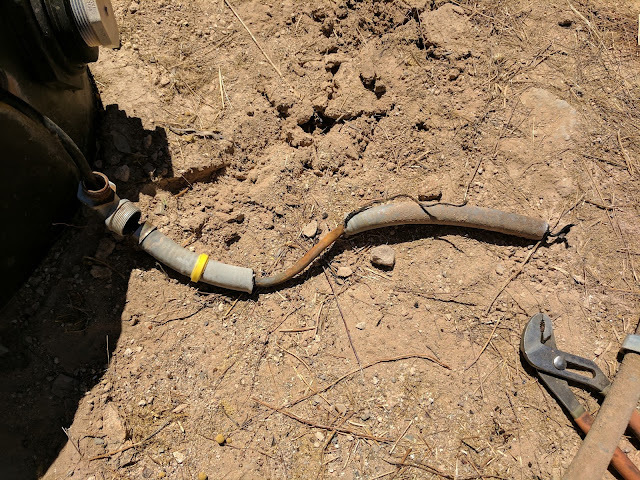 See, the problem is that no one was able to pull the wire out of the conduit, so they took the easy way out; they cut the wire and spliced in a new float. I'm not sure how long this has been going on, but the float has failed twice since I've been out here. No, I wasn't in charge of the well back then. Remember, this float switch carries 1.5 horsepower worth of current at 220 VAC; not a safe situation. I have to give credit to the last person that worked on this though. The tape has held up well and didn't leak. That person was good with tape. Now, when you replace the float, you do it inside the box and wind up a little slack in there also in case you have to do some adjustments in the future. The way this works is the weight holds the float at some level inside the well. When the water is low, the float hangs down a closes a switch inside to turn on the well bottom pump. As the pump fills the holding tank, the float rises and at some point, determined by the position of the weight, the float tilts and turns off the current. A very simple circuit that is used in wells all over the world. The water is drawn from the tank at the bottom by a jet pump on the surface and sent to the houses it serves. We'll get to the problems I had with that in a future post. I still haven't replaced the float. I had to order it because it was much, much cheaper online than out in town. Also, the one that was in there was only for a single horsepower. That may be the reason the floats have failed in the past; they were under rated. Only time will tell, these things may fail faster than the other parts of the well. 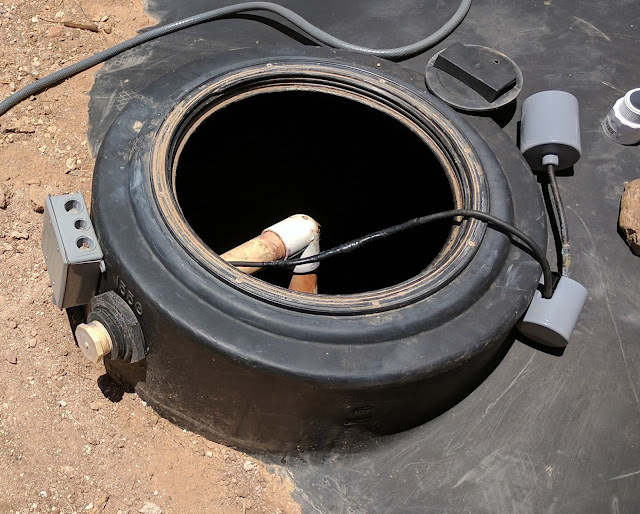 Yes, I'm very, very careful with the float; water could get through the tape at any time, especially with me dragging it in and out of the well. No, I didn't open up the conduit to find the splice inside where it went from the float cord to the lamp cord. It just wasn't worth the time to hunt it down. Actually, to prevent my curiosity causing me to waste a bunch of time finding it, I threw the conduit away. I'm a little OCD about this kind of stuff and would have been cutting on the conduit for hours with a Dremel tool. I just might have to do it again, but at least it will be something I'm familiar with. Same float as used in the septic tank. Careful not to confuse them when putting them back. I have GFI breakers on my pumps and controls. When splicing in wet conditions use rubber splicing tape, then black tape over that followed by spray glyptol paint. You can submerge the splice without worrying about it for years. Learned that working in the shipyards with the electrical gang on Lake Superior freighters. Alternative put the splice in a box out of the water. 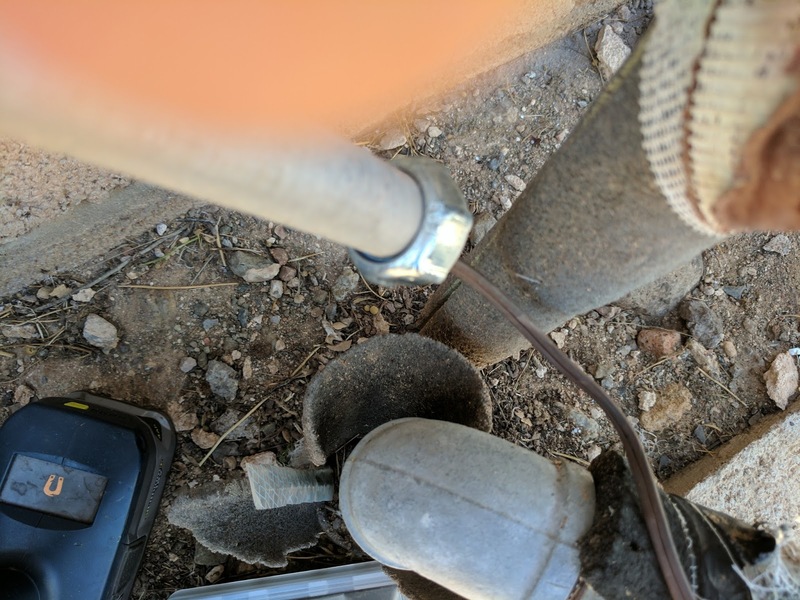 I have a mercury switch in my septic tank. They last longer and are easier to set, but you probably don't want mercury in the water tank. Never heard of one of those thing leaking, but who knows? 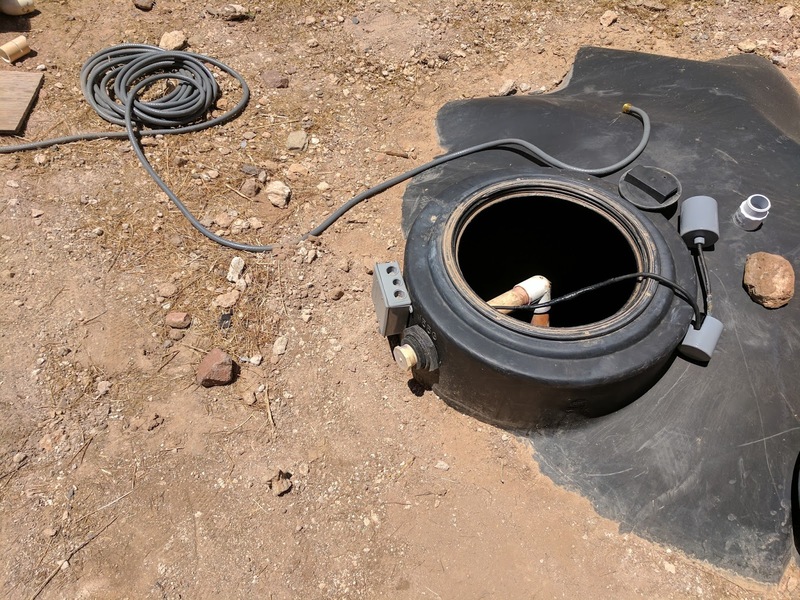 Yea, I took the easy way out and put the connection in a box on the side of the well. Dave - you know better than to have the float switch directly controlling the pump, with 220 volts @ 3+ amps. Put in a 12 volt control loop on that float switch, controlling a relay. Or, being the tecky that you are, use a RPi or Arduino controlling a big SCR. You have no idea how tempted I was to automate the entire thing. Big old SSR driven by a little computer with sensors all over the place, but it has to be repairable if I'm out of town, and this is the way the well companies expect things to work. If I was on the well alone, I would be making this an incredible example of home automation.